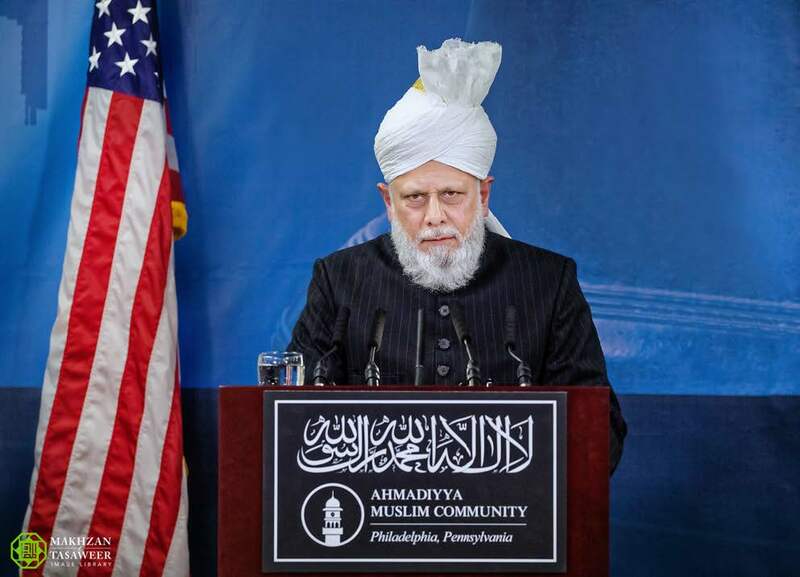 On the evening of 19th October 2018, the World Head of the Ahmadiyya Muslim Community, the Fifth Khalifa, His Holiness, Hazrat Mirza Masroor Ahmad delivered the keynote address at a special reception held to mark the inauguration of the ‘Baitul Aafiyat’ (House of Security) Mosque in Philadelphia, USA. 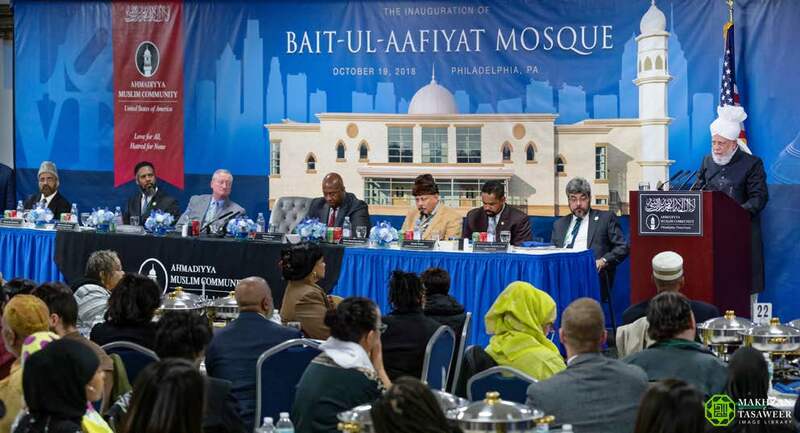 The Mosque, which is the first purpose-built Mosque in Philadelphia, was officially opened earlier in the day when His Holiness delivered his weekly Friday Sermon. Over 175 dignitaries and guests attended the evening reception held in the new Mosque. 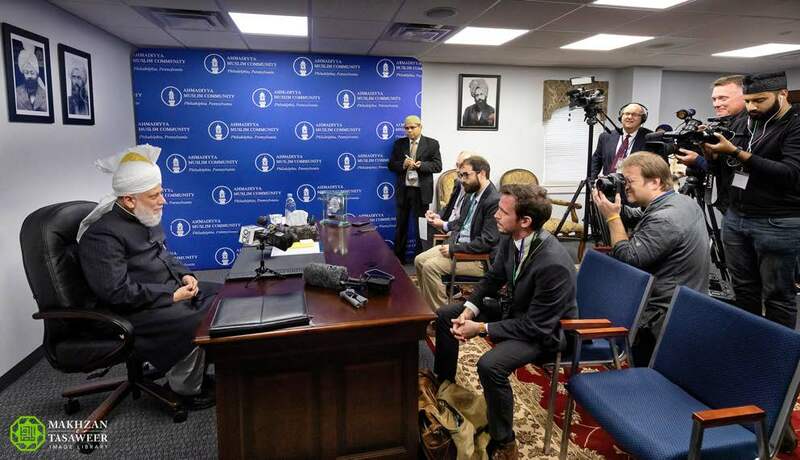 The highlight of the event was the keynote address delivered by Hazrat Mirza Masroor Ahmad during which he spoke of the true objectives of Mosques and stated that freedom of belief is a core tenet of Islamic teachings. Throughout his address, His Holiness emphasised the importance of fostering unity and tolerance within society. 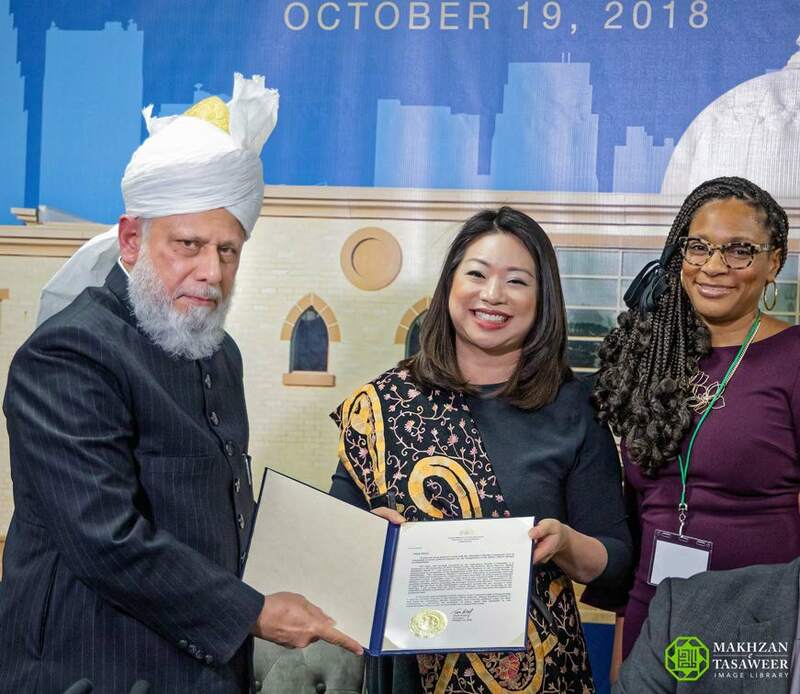 Referring to the Ahmadiyya Muslim Community’s motto of ‘Love for all, Hatred for None’, His Holiness said the slogan was nothing new, rather it was based directly upon the teachings of the Holy Quran and of the Holy Prophet Muhammad (peace and blessings be upon him). He said that Islam taught Muslims to respect people of all beliefs and religions. 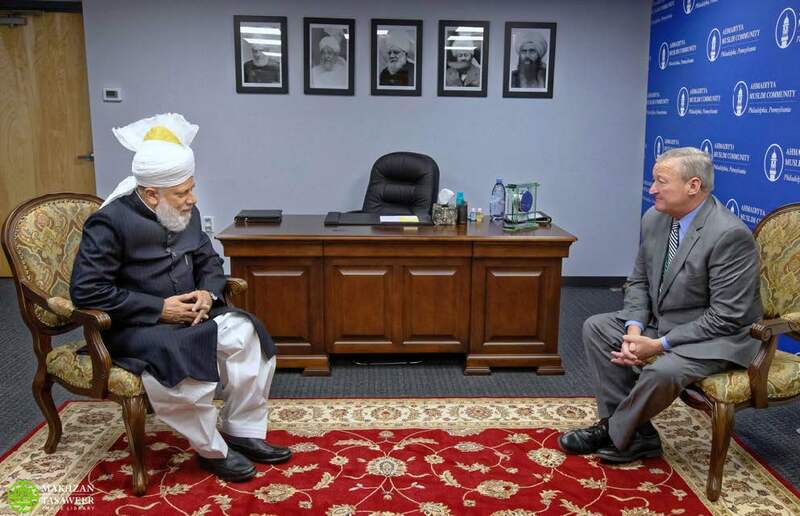 His Holiness said that the Ahmadiyya Muslim Community was “ever-ready to extend a hand of friendship to others”. 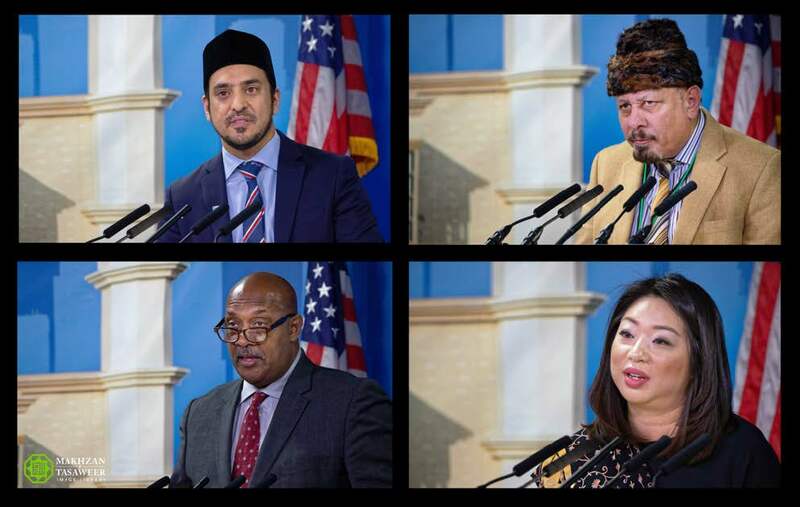 He cited the example of Ahmadi Muslims living in Philadelphia who immediately offered their support to members of the Jewish community following an attack at a nearby Jewish cemetery. His Holiness said that Islamic history bears testament to “pluralism and broadmindedness” having always been core tenets of Islam and referred to the government and covenant established by the Holy Prophet Muhammad (peace and blessings be upon him) in the religiously diverse city of Medina where everyone was able to freely practice their faith. Concluding his address, His Holiness reflected upon the history of Philadelphia, which was the first colonial city to permit freedom of religion and freedom of worship in America and is the historic city where the Declaration of Independence was signed. 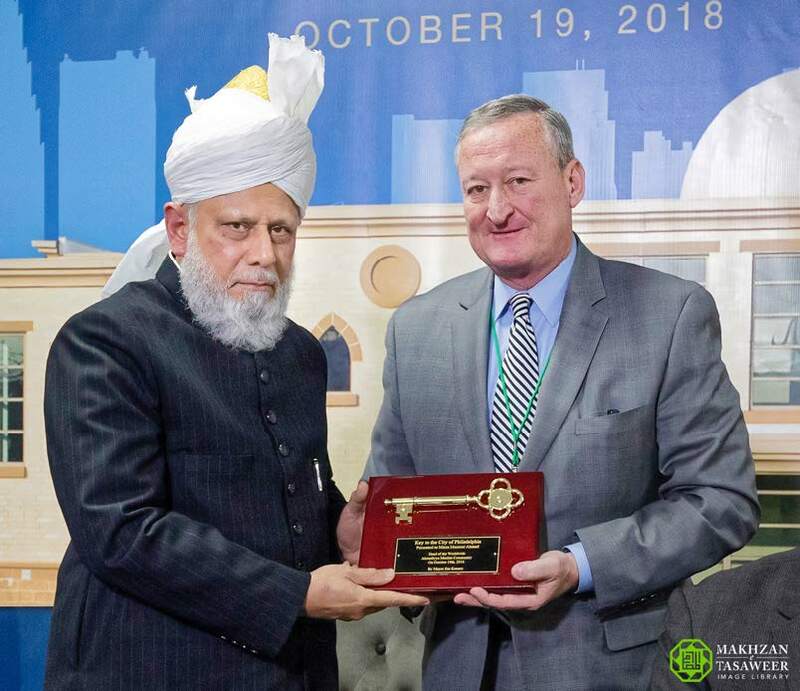 The Mayor of Philadelphia, James Kenny presented the key to the city of Philadelphia to His Holiness as a show of respect and appreciation. The event concluded with a silent prayer led by His Holiness. Later, His Holiness personally met with many of the guests who attended the reception. 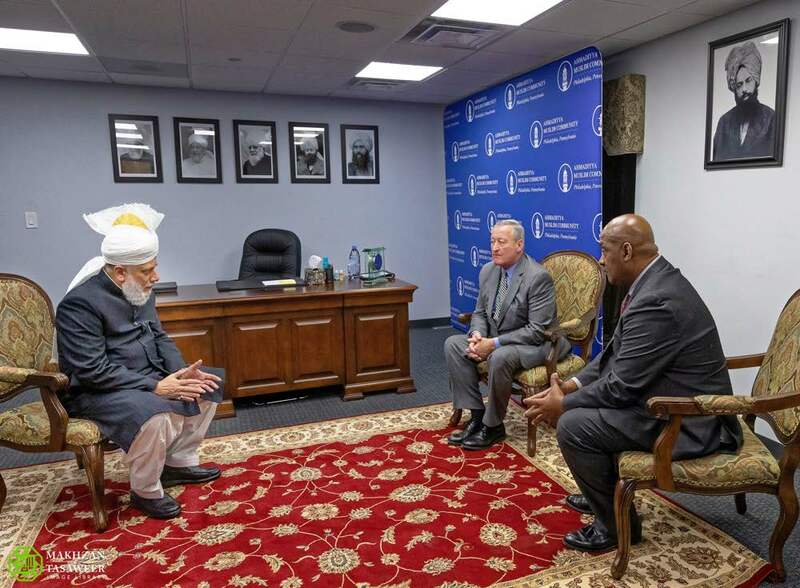 Prior to the reception, the Mayor of Philadelphia, James Kenny and Congressman Dwight Evans were able to have a personal audience with His Holiness. His Holiness also met members of the assembled media and answered questions about the objectives of the new Mosque and other related issues.